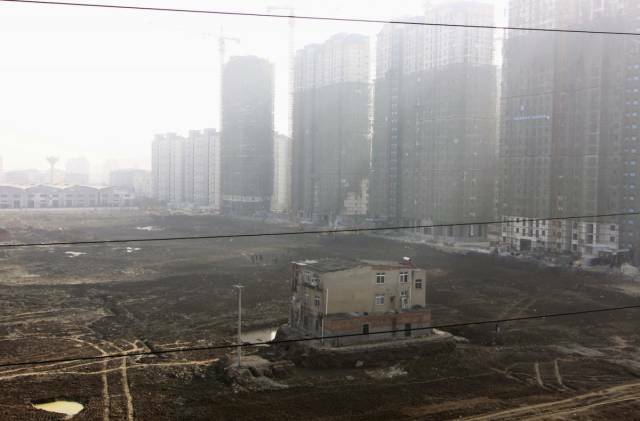 In China, “nail houses” are the homes that belong to people who refuse to make room for real estate development which is growing fast lately. This term is actually a pun coined by developers that refers to nails that are stuck in wood, and cannot be pounded down with a hammer. 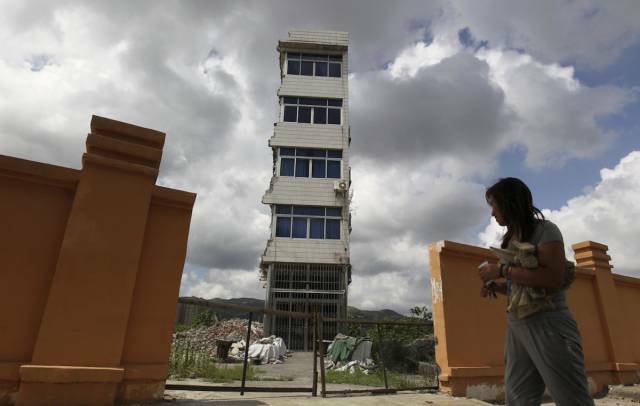 The owner of this six-floor villa refused to accept the compensation offered by the developer who plans to build a financial center on the site. 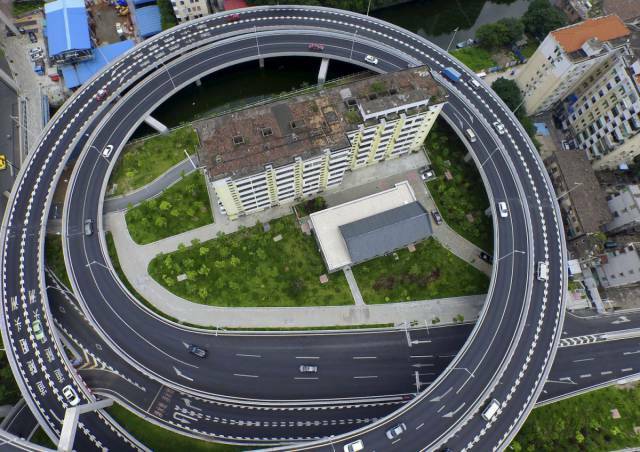 An old residential building is surrounded by a newly built ring viaduct in Guangzhou, China. 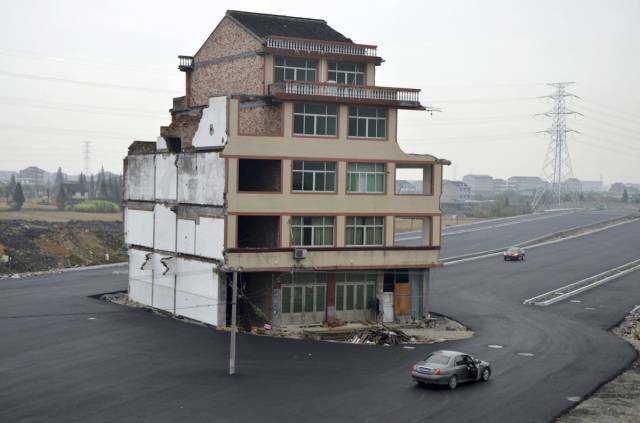 This "nail house" sits in the middle of a road under construction in the Guangxi Zhuang Autonomous Region. 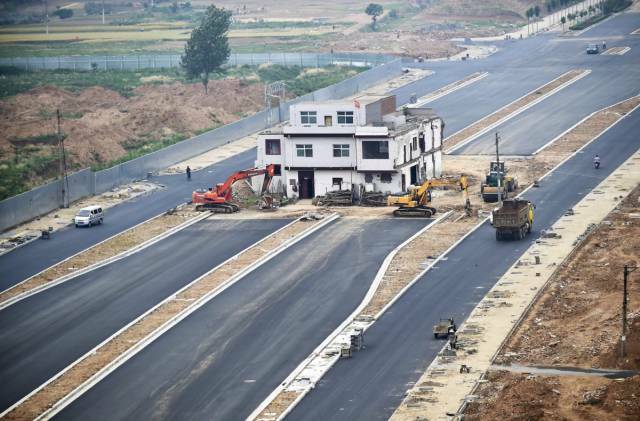 An elderly couple refused to allow their house to be demolished, so it’s now the only building left standing on the road paved through their village in the Zhejiang province. 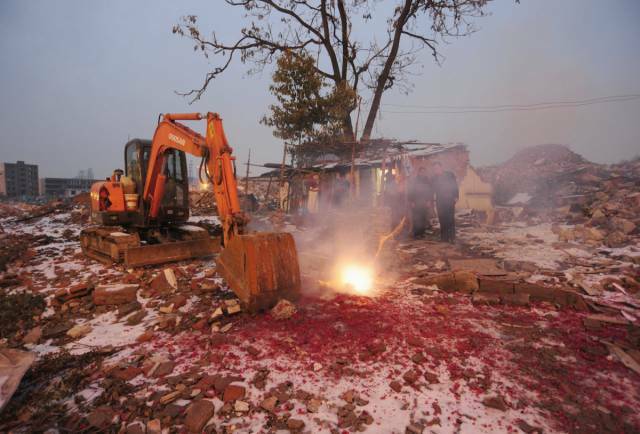 Cao Wenxia, the owner of this "nail house" in Hefei, lights firecrackers to celebrate the Chinese New Year. 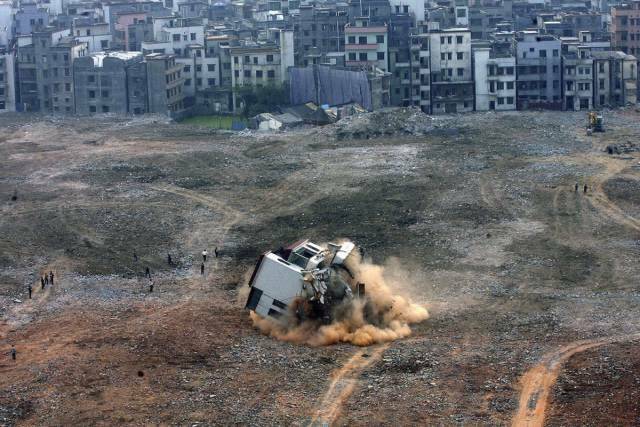 A bulldozer used to demolish nearby buildings sits ominously close. 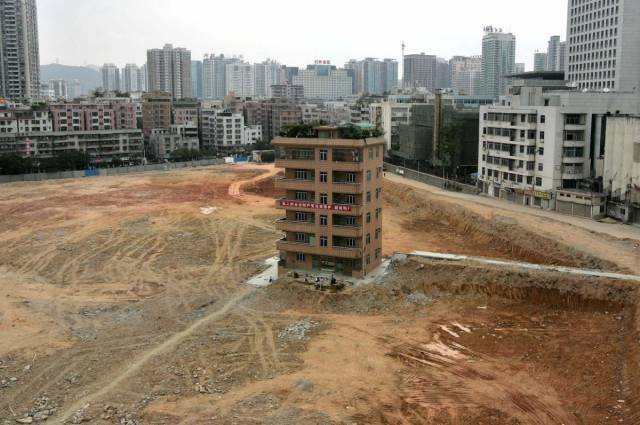 The last house in this area of Guangzhou stands in the middle of a construction site where an apartment complex will be built. 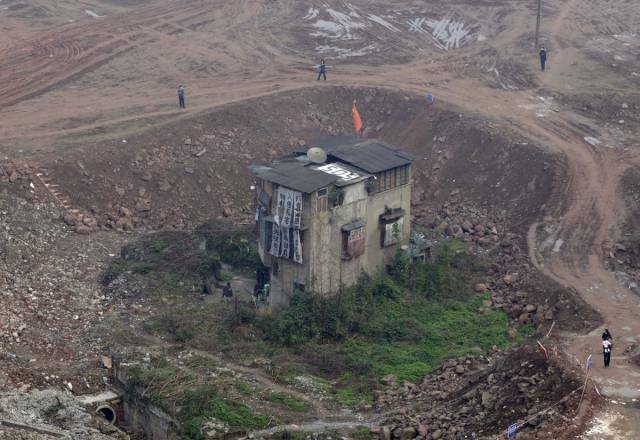 A partially demolished "nail house" sits on a construction site in Anhui province while the owner seeks more compensation. According to local media, the brothers who own this house did not reach an agreement about how to allocate the government compensation, so they haven’t signed a relocation agreement. 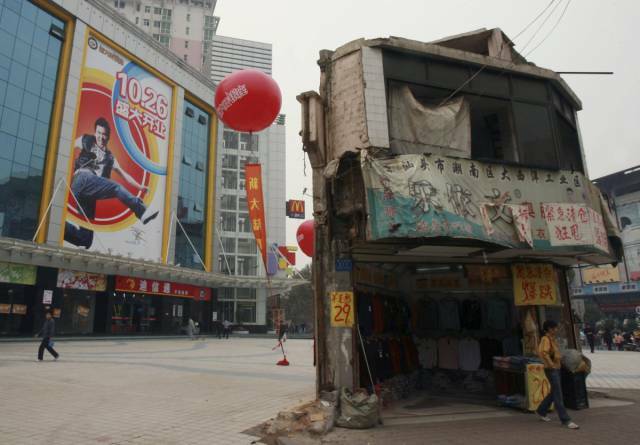 The last house in this area stands in front of a shopping mall in central China's Hunan province. The owners of the house filed but lost a lawsuit against the developer of the land, which will be used for a high-rise-apartment project. 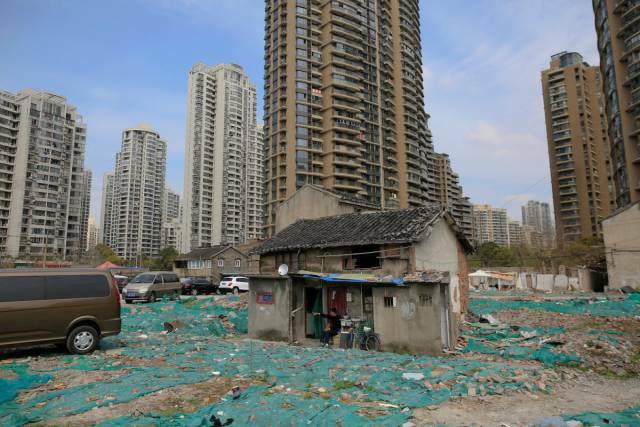 When this photo was taken, Zheng Meiju, the owner of the building pictured, had been living without electricity or water for six months, according to local media. 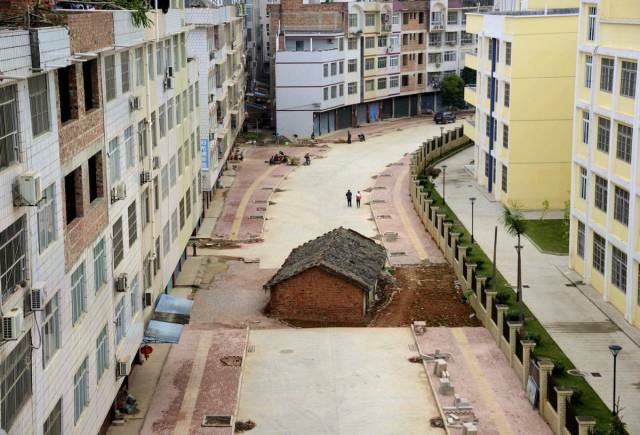 This "nail house" is surrounded by a ditch at a construction site for a new residential compound in Hubei province. The banner on this house reads, "strongly requesting the government to punish the developer who demolished my house, give back my home." 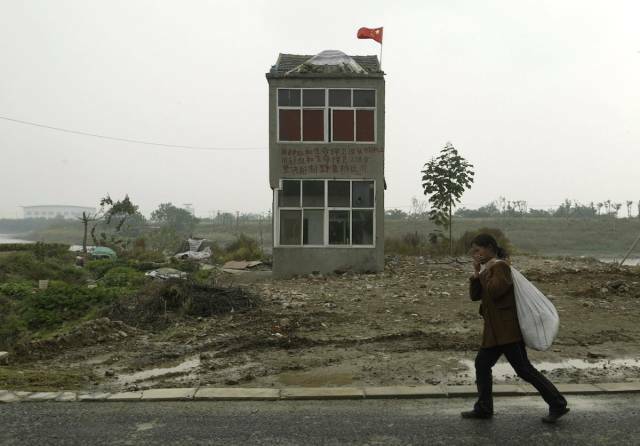 A woman walks past a “nail house” on the outskirts of Nanjing, where the land will be used for a wetland project, according to local media. 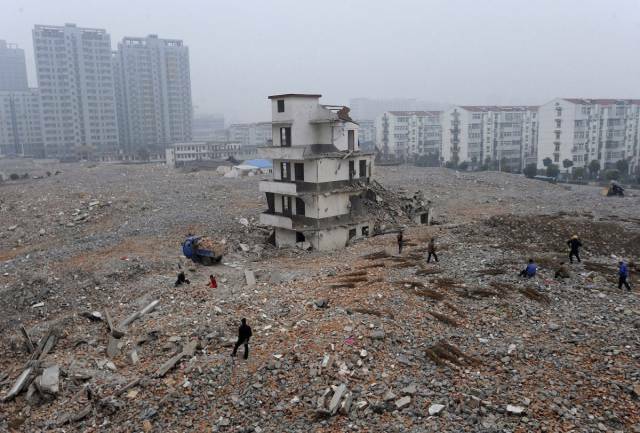 The construction site where this house sits in the Chongqing Municipality will be developed as a new zone of apartments. 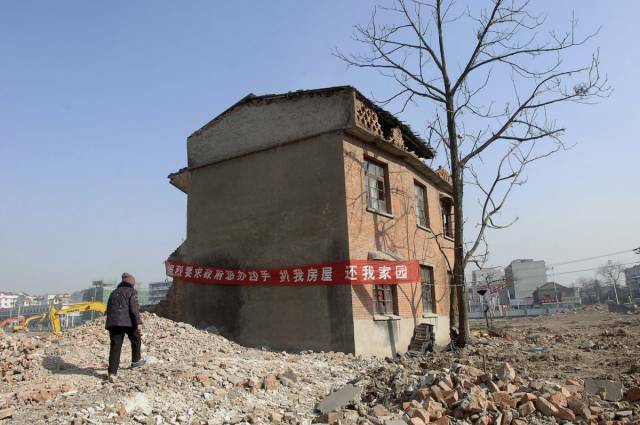 Owner Zhao Xing, 58, collects water near his partially demolished "nail house" in Yunnan province. Local media reported water and electricity supplies had been cut. 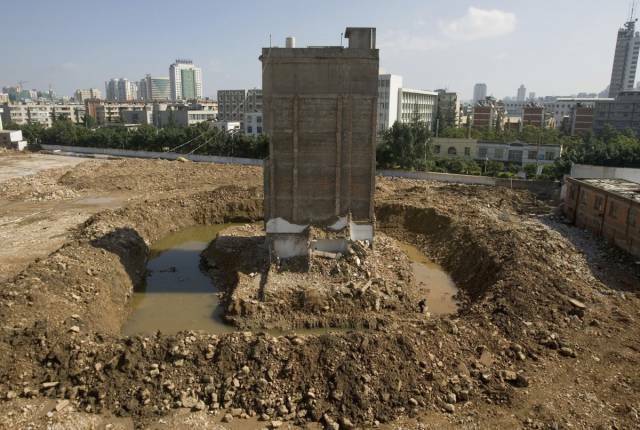 This "nail house" house sits on a mound above ground level because the developer dug out the land around it. 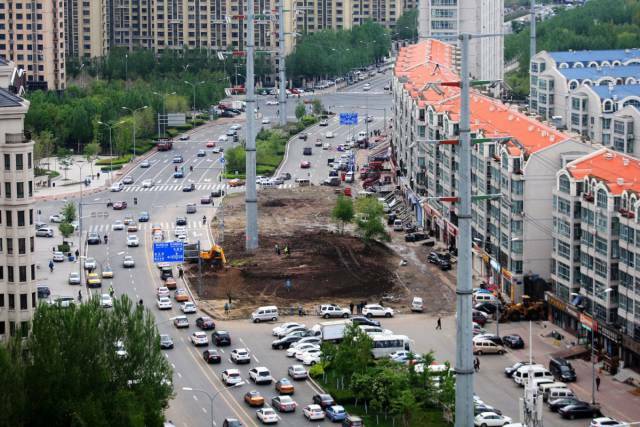 A three-story "nail house" with a Chinese national flag on its rooftop is seen in the middle of a newly built road in the Henan province. 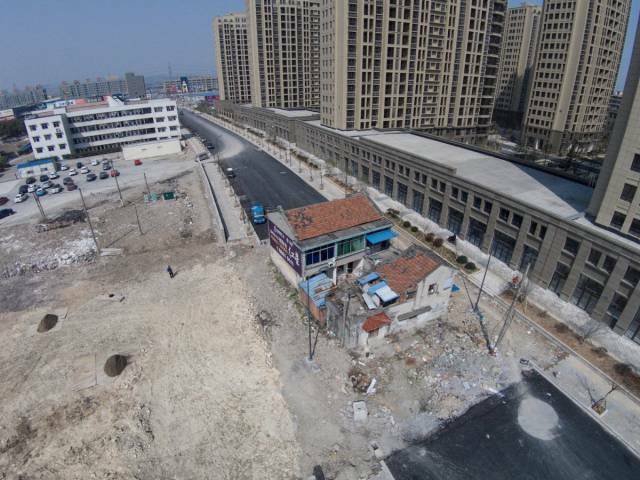 A "nail house" once stood in the middle of this road in the Heilongjiang Province, but it is in the process of being demolished and removed. 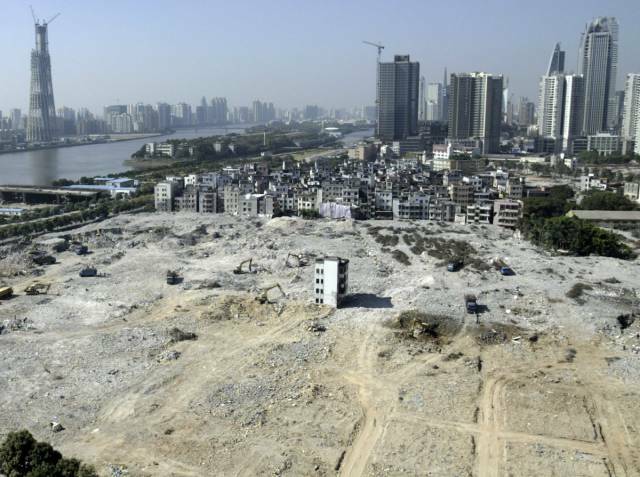 Residents of the Guangfuli area of Shanghai have collectively decided not to leave their homes, creating an entire "nail neighborhood." 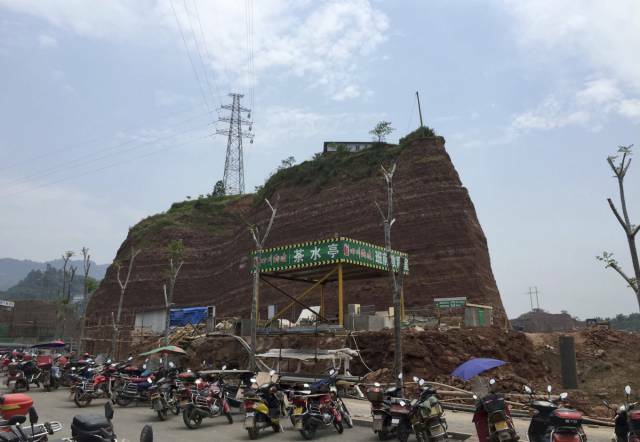 Tao Weiren sits in front of his two-story house there, which is now surrounded by high-end condominium buildings.